Ah, stress! What a great place to start. If you're already familiar with Hanna Somatics you know that all humans respond to stress in very predictable full body patterns of muscular holding. Muscles that are tight have learned to stay tight due to "contract" signals from the brain. The key to releasing tight muscles and regaining optimum muscle function, whether in the back, shoulders, legs or jaw, is to reset the brain's sensation and control of the muscles. TMJ is a functional problem of the muscular system and it can be reversed with somatic movement. TMD and TMJ are somatic problems of a functional nature - yet another example of Sensory Motor Amnesia. 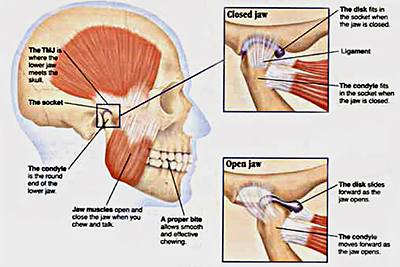 TMJ can occur due to a one-sided accident, slumped posture over the computer, and most commonly, excessive dental work. I just successfully reversed a serious case of TMJ that developed due to a lot of dental work. The photo below is from the last of six visits to my dentist's office. Notice in the photo on the left how my head and neck are turned slightly to the right. Trust me when I say that there was tension in my neck, jaw and face along the right side. What you can't see because of the paper sheet over my chest is that my shoulders were rounded forward. This is a typical "dental patient posture." "Dental patient posture" is a Red Light Reflex pattern of collapsing inward with the neck cocked backward. The need to keep the jaw open and often contract one side of the jaw to make room for dental implements or hold them in place teaches the muscles that move the jaw to stay tight. This contributes to TMJ. The muscles of the face are no different from muscles in the rest of the body; they can be reeducated through somatic exploration. In this video I demonstrate a sequence of Somatic Explorations that will teach you to retrain the muscles that move the jaw so that they can relax and release. You will learn to move your jaw freely again... without pain! Repeat these movements several times at your own pace. You will explore the natural movement of the jaw: open, close, side to side gliding and gently swinging as if making a "U" shape. Remember: TMJ is part of a larger pattern of muscle tightness in the center of the body. I recommend learning basic Somatic Exercises (click here to buy my DVDs), especially those for the neck and shoulders. Your brain controls you as a system, not as separately moving muscles that have no relationship to each other. There are larger muscles at the center of the body that attach up into the neck and skull an help them move easily and freely - or create restriction and tension. When these larger muscles (especially the back and front of the body) hold excess muscle tension, they, too, can contribute to TMJ. Learn to release the full body pattern of tightness in the center first and these easy pandiculations will have a more beneficial and long lasting effect.